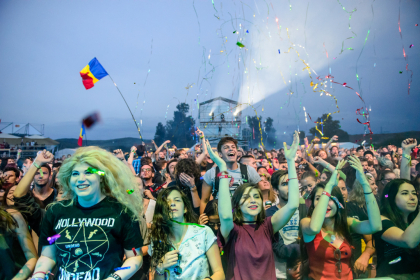 Romania's leading music festival for rock and electronic music, Electric Castle, will be bringing great names to the stage in 2017, including: Franz Ferdinand, Paul Van Dyk, Zedd, Unkle, Cassy, Mike Skinner, Mistajam. They join the likes of Alt-J, Moderat, Noisa, and Slaves in providing world class sets at the event, which is held 12 - 16 July. The setting of the crumbling 15th century Bánffy Castle, and the surrounding tranquillity of the Romanian countryside, provides a backdrop for the event that's just staggering. Of course, the tranquility of these extensive grounds will completely transform as 130,000 people from all over the world arrive this summer for one of the best, and also most affordable festivals in Europe. Line-up highlights include the brilliant Franz Ferdinand, who remain one of the best live guitar bands the UK has ever spawned. UNKLE, headed up by the most incredible DJ James Lavelle are a mesmerising live band and conjure up a psychedelic dance sound that's some of the most avant-garde and inspired music of a generation. Meanwhile, Zion Train are one of the greatest reggae/dub groups in the UK and a perfect festival band; guzzling on those £1 beers in the sun listening to that will be a pleasure you shouldn't want to miss. There's so much more, too, check out the full 2017 line-up below.